The Model F first appeared with the IBM System/23 Datamaster all-in-one computer. It is best known as part of the IBM Personal Computer in 1981 with some keycap label differences, and its subsequent release with the IBM Personal Computer/AT, where it was reconfigured with the AT protocol and some layout revisions. The capacitive design is widely considered superior to that of the later membrane design used on the Model M. It has a lighter actuation force of about 600mN, a crisper feel and louder feedback, and is more robust. It also has a higher MTBF of over 100 million keypresses, and full n-key rollover. The sound of an IBM Model F from 1984. Model F 'XT' 1801449 Released in 1981 with the original IBM PC. Uses an XT connector. Model F 'AT' 6450200 (US version)  Released in 1984 with the IBM PC AT. Uses an AT connector. Model F '122-key terminal keyboard' 611034x Terminal keyboard released for the IBM PC 3270. Uses an IBM proprietary terminal connector. Model F '104-key terminal keyboard' 1387033 Terminal keyboard released for the IBM 5085 and IBM 3290. Model F 'Displaywriter' ? Keyboard released for the IBM Displaywriter System, these Model F keyboards featured fully white keys. As of 2016–2017, a project is underway to manufacture for sale keyboards with a faithful re-creation of the model F mechanism, completely independent of IBM. The Model F's key-switch design was more durable than IBM's previous beam-spring mechanism, which was prone to failure from debris and was more complex to manufacture and service. The spring assembly consisted of a top metal plate with cut holes where the plastic spring barrels reside; a bottom sheet of metal then holds the assembly together and compresses the contact sheet with a foam spacer. Earlier Model F keyboards cannot have their space bars removed without disassembling the internal assembly, this also causes a slightly different feel response from the space bar specifically: some enthusiasts modify the tension of the stabilizer on these early Model F keyboards to provide a more satisfactory response. The top metal plates in Model F keyboards are prone to corrosion and the internal foam can also rot from age, which often requires cleaning and a coating to prevent further corrosion. All Model F internal assemblies are held together with metal tabs, unlike the Model M which uses melted rivets requiring more rivets to be melted on or modified with bolts. A characteristic feature of the Model F is a plastic top shell painted with a cream paint to create a rough texture. The later Model M keyboards used injection plastic rather than paint to achieve this texture. The plastic used in the Model F is quite brittle and prone to hairline cracks, and the paint can wear off from excessive use. 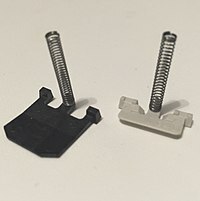 A comparison between a Model F spring (left) and a Model M spring (right); the Model M uses a spring with fewer windings and smaller plate for the plastic membrane underneath. ^ Bradley, David J. (September 1990). "The Creation of the IBM PC". BYTE. pp. 414–420. Retrieved 2 April 2016. ^ Limer, Eric (5 July 2017). "The Best Keyboard Ever Is Back". Popular Mechanics. ^ Killian, Zak (6 July 2017). "Model F keyboard gets a modern reboot". The Tech Report. ^ Strandberg, Joe. "Brand New Model F Keyboards". Retrieved 2017-07-08. Model F Labs – current Model F manufacturer.